An advertisement from Barbera's Autoland on 13th and Market streets. 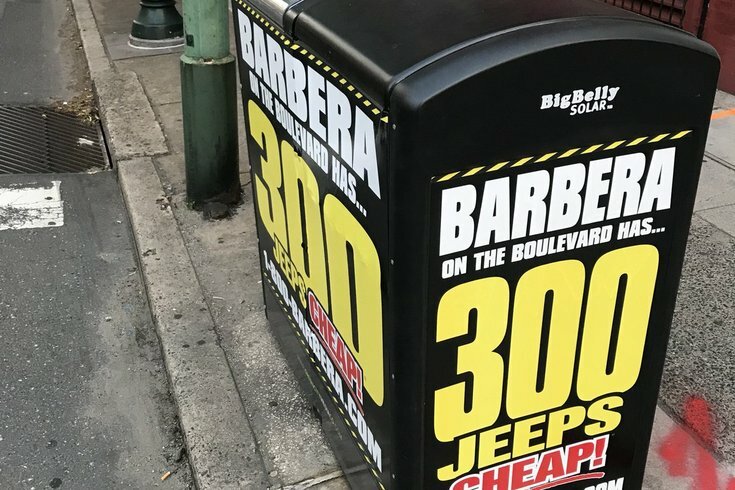 Reports of people taking offense to the new advertisements plastered onto Bigbelly trash cans punctuating nearly every block in Center City have officially started to circulate. Have you seen them? Bet you have. They're all down Market Street, inside the City Hall breezeway, even scattered through some of our residential neighborhoods. And they've got "cheap" written all over them. No, literally. The ads belong to Philly car dealer Barbera's Autoland — yeah, that's the car dealer with those commercials you will never get out of your head — and philly.com reported the ads are valued at $1.25 million in a 10-year contract with Bigbelly. The city will receive 5 percent of the revenue. So far, the city has sold advertising space on 200 of its cans around the city, and by the end of July that number will reach 375, according to the same philly.com article. And while we're on the subject of the city's trash management, City Controller Alan Butkovitz issued a review of the Street Department's management of Bigbelly units, worried there was no valid cost effectiveness or way for the department to utilize the technology effectively. Basically, he said it wasn't worth it to buy more. In 2017, the city purchased 275 more Bigbelly units at no additional cost to taxpayers. YUP. These are all over the historic area too. The one at the corner of 6th and Race was overflowing yesterday on Flag Day, What an embarrassment. I don't advocate vandalism... but i hear they peel off pretty easily.